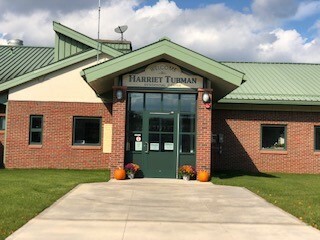 The Harriet Tubman Residential Center (HTRC) is located in Auburn, New York. The main building has two living units, two classrooms, a medical unit, and a cafeteria that connects the living units and is used for meals and daily culinary arts programs. The living units contain a large, multi-purpose area that is used for programs on evenings and weekends. A second building contains a gymnasium and a large room holding a library and a computer lab. The campus design includes the latest security and safety measures and open, spacious areas for the optimal supervision and comfort of youth. The youth served at HTRC are females adjudicated and placed with OCFS by the Family Court. They are generally 16-17 years old, however the program can also serve those as young as 13. Dialectical Behavioral Therapy (DBT) - A therapy designed to help people suffering from mood disorders as well as those who need to change patterns of behavior that are not helpful, such as self-harm, suicidal ideation, and substance abuse. This approach works toward helping people increase their emotional and cognitive regulation through 4 main strategies (Mindfulness, Distress Tolerance, Interpersonal effectiveness, and Emotion Regulation). DBT assumes that people are doing their best but lack the skills needed to succeed, or are influenced by positive reinforcement or negative reinforcement that interferes with their ability to function appropriately. Sanctuary Psycho-Educational groups - Sanctuary is a treatment model that guides staff, youth, and families, allowing them to share the same values and language. Innervisions (Substance Abuse Education) - This is a comprehensive prevention program targeting alcohol, tobacco and other drugs. This curriculum tests the youth’s knowledge of substance abuse and the effects on themselves, relationships and others. Seven Challenges (Substance Abuse Treatment) - Designed for adolescent and young adult substance abusing and substance dependent individuals to motivate decisions and commitments to change. Once such decision’s and commitments are made, the program guides young people toward success in implementing the desired changes. Education- The facility provides educational programming for youth according to New York State Education Department requirements. The Committee on Special Education addresses special education needs and develops individual education programs for classified students with disabilities. State assessments including Regents examinations and competency tests are also provided to eligible students. Qualifying youth may also enroll in the Alternative High School Education Programs and pursue a Test Assessing Secondary Completion (TASC). Academic and vocational courses are offered so students can earn credits that can be applied toward a high school diploma upon a student’s return to a community school. Students also complete a “portfolio” that provides a summary of relevant documentation and outlines work history, any certifications earned, and experiences gained. A partnership with Cayuga Onondaga BOCES Adult, Alternative and Career & Technical Education (CTE) Programs will support students’ development of employee competencies, and school achievement through credit recovery classes. BOCES CTE instructors will present nationally recognized CareerSafe Certification programs that support school-to-work learning. • On-the-job training is a job-readiness program that provides designated youth the opportunity to practice the skills learned in their vocational classes. The program provides mentoring and job training, and enables youth to gain valuable work experience while earning a small stipend. Youth earn a certificate for their portfolio. • National Work Readiness Credentials is a job-readiness class offered periodically throughout the year. Students are taught how to read business memos, inventory receipts, letters and correspondence. They learn business math, including basic math computations and how to do mark-ups, mark-downs and percentages. Situational judgement is a component of the course that puts youth in various scenarios where they are expected to respond appropriately and utilize active listening skills. • The culinary program provides youth with project-based learning activities, teaching entry-level skills for positions in the food service industry. Students earn their SERV Safe Certificate. Partnerships with local bakeries, CISCO, and local markets allow students to practice life skills daily. • Careers & Financial Management is a course offered to help youth learn to write resumes and cover letters, practice interviewing, and learn budgeting and the basics of finance. Portfolio development is part of this course, which involves the use of computer skills and programs. Included in the portfolio are essential documents such as working papers, and birth certificates. • The Utah Endless OS laptop computer pilot program provides individualized instruction for all students. The self-directed curriculums include, but are not limited to, MIT college courses, Advanced placement credit recovery, basic computer skills, textbook support, and coding. Health Services: Medical care is provided seven days a week by a team of health practitioners. Recreational: The recreational programming is managed by recreation specialists. The recreation program provides youth with activities that encourage sportsmanship, build self-esteem, and challenge their ability to solve problems as a team. Recreation activities include group fitness, sports, team building, and arts and crafts. Religious Services: Youth are encouraged to express and practice their spiritual/religious beliefs. The OCFS chaplain provides services and connects the youth to various community resources. Youth participation is voluntary. Visitation: Visitation with youths’ families/guardians is on Saturdays and Sundays from 1 p.m. – 3 p.m. Various community partnerships are offered, including: a partnership with Cayuga Onondaga BOCES Adult, Alternative and Career & Technical Education (CTE) Programs, helping students develop employee competencies and school achievement with credit recovery classes; nationally-recognized CareerSafe Certifications provided by BOCES CTE instructors; guest speakers from Career Professionals and local businesses; dance/step, music; project-based learning activities for charity events; collaboration with OCFS facilities creating gifts for the community; blended learning opportunities with the Utah Endless OS laptop computers; and other enhancements programs. Permanency Planning: Permanency planning begins upon admission. The facility staff work with the youth, the youth’s family/release resource, community worker to develop a release plan. Monthly Support Team Meetings, involving all team members, include review of the youth’s goals, progress toward achieving the goals, and interventions provided by team members. Release and permanency planning are reviewed at each meeting. The youth’s goals, strengths, challenges, and release plans are discussed in these meetings.